John Willson is a widely published poet, winner of the Pushcart Prize, and recipient of awards from the Academy of American Poets, the King County Arts Commission, the Pacific Northwest Writers Conference, and the Artist Trust of Washington. His work has appeared in various literary journals, in JAMA, and in the anthologies Spreading the Word: Editors on Poetry, Under Our Skin: Literature of Breast Cancer, and Weathered Pages. One of his poems is featured at the Bainbridge Island High School swimming pool where it forms a permanent part of Maggie Smith's public arts project 'Water Quilt'. 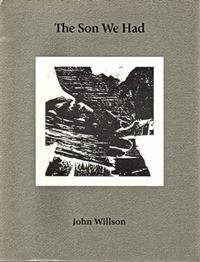 Willson has also published a collection of poems, The Son We Had, and is editor of Exhibition, a Bainbridge Island literary and visual-arts magazine. Additionally, he is in charge of the poetry section at the Eagle Harbor Bookstore and holds local poetry workshops to support other poets. Sue Hylen, a fellow poet, says of Willson: "He inspires people not just to write their own work but also to see each others work, and have the courage to comment".